Happy Holidays! What a nice surprise; mlb.com Nats beat reporter Bill Ladson posted his first mailbag/inbox column since January 2014. He must have been bored during the holiday lull in baseball news. As always, since its been like a year since I did one of these, I write my response question by question before reading Ladson’s, and sometimes edit questions for clarity. Q: Assuming the Nationals don’t make any acquisitions via trade or free agency, what is their in-house solution for second base? A: Well, in order they’d likely start Danny Espinosa and bat him 8th. 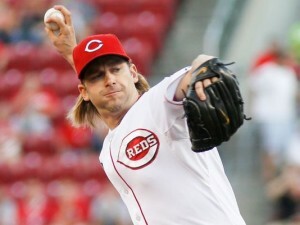 And, if the fans’ had their choice, he’d abandon switch hitting, bat righty only and probably have a career resurgence. Just a reminder: Espinosa’s career lefty split is .213/.283/.362 while his career righty split is .271/.343/.460. Espinosa is so good defensively that i’m not entirely opposed to him being the starter; he can spell Ian Desmond at short (in fact, I’ve always thought Espinosa was a better shortstop defensively) and makes up for his awful switch hitting by being so good defensively (but not nearly enough to prevent the team from shopping). After Espinosa, you have utility guy Kevin Frandsen having stated publicly he wants to be considered for the job. Problem with Frandsen is this; he’s been even WORSE offensively the last two years than Espinosa; he has a .624 OPS in the last two years. I hope there’s not anyone who thinks he’s a better solution. 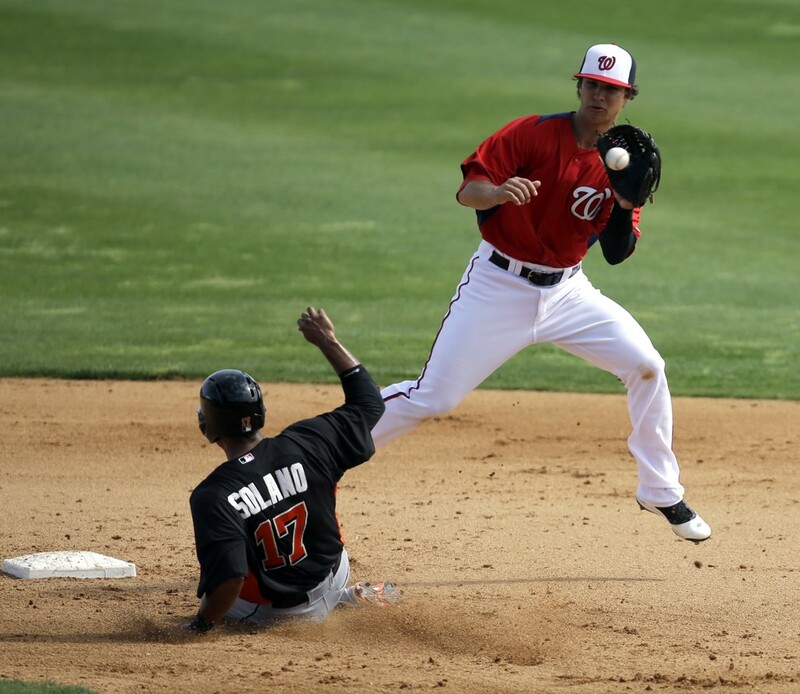 Youngster Wilmer Difo was just added to the 40-man roster, but he’s never played above low-A. That’s basically the roster of middle infielder options on the 40-man roster. Jeff Kobernus played 2B in college but has long since been converted to an outfielder in this organization, so he’s not really an option either. Looking deeper into the minor leagues, there’s some MLFA options at AAA (the likes of DC-native Emmanuel Burriss, current MLFA and Virginia-native Will Rhymes, or maybe even our own long-time org player Jose Lozada), and a couple of Nats draftees who have yet to pan out (Rick Hague and Jason Martinson). But none of these guys are better options than just sticking with Espinosa. Hence, the reason the team is looking at trade/FA options. There’s a ton of 2B options that are likely available in trade or still on the FA market; its arguable that any of them are better options than just staying the course though. So it wouldn’t surprise me at all if the team stood pat. Ladson reviews the same three 40-man options and comes to the same conclusions as I do, and says he sees a trade. He likes a trade for Ben Zobrist, like I do, but Tampa is notoriously hard-bargaining. What would we be willing to give up to get Zobrist? Q: Why are the Nationals willing to trade their best pitcher, Jordan Zimmermann? Wouldn’t Stephen Strasburg get them a better return? A: I’m sure Strasburg would get a better return; he’s got two years of control instead of just one, and is scheduled to make a third of what Zimmermann will make in 2015. I feel Strasburg is in some ways actually under-rated; despite a pedestrian 14-11 record in 2014, here’s his ranks in the entire majors in some quick categories: 13th in fWAR, 3rd in xFIP, 13th in FIP, 5th in K/9, and 5th in SIERA. Teams are now smarter when it comes to acquiring control; a year of Zimmermann at $16M+ isn’t going to bring back that much anyway (see what the Rays got for David Price, for less money and TWO years of control). 1. Money: As i’ve discussed in the past, the Nats payroll was at $135M at the beginning of 2014 and projects to nearly $150M without any subsequent moves. 150M minus Zimmermann’s 16.5M 2015 salary looks an awful lot like the payroll from 2014…. 2. Practicality: You don’ t need to win your division by 15 games. You can still win by 5 games and make the playoffs. If the Nats can trim payroll, turn Zimmermann into something that look better than what we may get in a supplemental 1st round pick, AND still win the division in 2015? Wins all around. Ladson says several things I disagree with; he thinks Zimmermann would bring back a “kings ransom” and he thinks Rizzo is going to “get a deal done” with Zimmermann this off-season. Q: Given that he’s at an age where he needs to play regularly, does Tyler Moore have a chance of backing up first baseman Ryan Zimmerman in ’15? A: Not sure what Tyler Moore‘s age has to do with anything; if you’re 22 or 42 you’re going to get ABs in the majors if you can play. To the question at hand; right now i’m projecting Moore to be the 25th guy on the active roster. That doesn’t mean he’ll make it, but he does fill a position of need; right handed power off the bench. Had the Nats not traded Stephen Souza Moore might be a goner. Now? He could still make the team. But somehow I sense that perhaps the team will look to flip him and/or bring in veteran competition for his bench spot. Ladson states the obvious, saying the team will look to trade him since he’s out of options. Q: Since it appears Michael Taylor is considered the future center fielder, can you see the team holding on to Denard Span beyond ’15? A: In a word; nope. I’m guessing that Taylor will get some experience as a backup in 2014 (and frankly may get a ton of at-bats, since our outfield isn’t exactly an injury-free haven), and soon the team will have a guy who can play a better CF than Span, hit with more power and run with more speed. All in all, I think Taylor will be an improvement over Span in nearly every category and for 1/20th the cost. Ladson says it depends on how Taylor does. 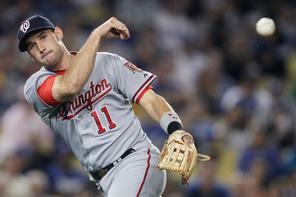 Q: Last year, the Nationals’ pinch-hitting average was terrible. Any hope it gets better? A: So far … not really. The bench is still projecting to be basically the same guys as in 2014. Frandsen, Loboton, McLouth and Moore. The only change is the dumping of Scott Hairston for Taylor. But Taylor’s K rate is still high, which means we’ll likely see continued crummy pinch hitting. Ladson points out the Nats havn’t had a good bench since 2012. Q: How is Lucas Giolito doing? Will he fill a rotation spot if Zimmermann or Doug Fister is traded? A: Not in 2015. Maybe by mid 2016 if Giolito has a two-level jump this year. Giolito’s best case is to completely shut down high-A in April and force a promotion to AA by mid-season. If that happens, then maybe we’re looking at a mid-April call up in 2016, just in time to replace the potentially departed FAs Zimmermann and/or Fister. But this is a very heady dream; remember; Giolito is still on an innings limit, is still just 20 years of age (he turns 20 in July of 2015), and most pitchers his age are still in college, yet to even be drafted. If we move Zimmermann or Fister this off-season, then we’re looking at drawing from our AAA rotation for the 5th starter. One of Treinen, Hill, Jordan or Cole. Probably in that order, thanks to 40-man and experience implications. Ladson is bullish on Giolito; thinks he’ll start in AA and get a call-up in September. That’d be pretty aggressive. Q: Why didn’t the Nats go after Russell Martin? Their catchers are less than adequate. Is Wilson Ramos still the guy? A: Disagree here. When healthy Ramos is a beast. Remember he was the frigging opening day 2014 clean-up hitter. The last thing the Nats needed to do was spend millions on someone like Martin. Lobaton is more than adequate of a backup, cost-controlled and we traded a hefty price (Nathan Karns) to acquire him. Ladson agrees with me. Who might the team protect ahead of the Rule-5 Draft this year? The topic came up recently in the comments so I thought i’d publish this post to open up the debate again. I’ve got a rule-5 history post as well that i’ll post later this week. And, as it turns out, Nov 20th is the deadline for adding players to the 40-man, so today’s as good a day as any to discuss. (Kilgore’s analysis here, Baseball’s off-season calendar here). The Nats off-season rule-5 protection debate really started in late August with an observation made about Zach Walters from Adam Kilgore in his pre-Sept 1 callup piece on 8/27/13. It was continued by the announced list of Nats AFL participants, which included a couple of significant Rule-5 protection candidates. Walters was subsequently added to the 40-man and called up, ending any Rule-5 speculation. As (allegedly) was Steve Souza, who hit the cover off the ball in AA in 2013, with power to go with his CF defensive capabilities. He followed that up by hitting .357 in the AFL, trailing just mega-prospects Kris Bryant and C.J. Cron for top hitting honors in Arizona. I say Souza was “allegedly added” to the 40-man because, while news of his 11/1/13 40-man addition was widely published at the time, but his name does not appear on MLB.com’s 40-man roster for the team nor does there exist an 11/1/13 transaction (Editor’s update: it was posted 10/31/13 and the MLB 40-man database was missing him in error; it was eventually fixed). I don’t know if its just a procedural thing or if all the beat reporters mis-reported the event and it should have been characterized as a “planned future” move. But I’ll assume for the rest of this article that Souza is going to be put on the 40-man before the rule-5 draft. Two of the most obvious Rule-5 candidates (even if Souza was technically a minor league free-agent to be) are now protected. Who else might we see added? Using the indispensable sites Draft tracker and the Big Board, and then giving some thought to prospect acquisitions made via trade, here’s some thoughts. The quick rule-5 rules; any college-aged draftee from 2010 or before who isn’t already on the 40-man roster is Rule-5 eligible this coming off season, and any high-school aged draftee from 2009 or before is newly eligible this year. Rick Hague: 2B/SS from Harrisburg; .673 OPS in AA, not good enough OBP for a middle infielder and no power. He’s well down the pecking order of backup middle infielders in this organization right now, and wouldn’t be a great organization loss even if he was selected. Chances of being drafted or protected: very slim. Jason Martinson: SS from Potomac/Harrisburg: Martinson finally earned a promotion above A-ball, where he promptly hit .185 in AA in 54 games. He showed a ton of power in 2012 for a SS (22 homers) but it was in Low- and High-A ball. Maybe he is a late bloomer. However he’s not in jeopardy of being protected or drafted at this point. No other 2010 college aged drafted hitter has even made it to Harrisburg; so they’re not going to get drafted or protected. This includes three draft picks in the first 10 rounds of that draft; understandable in that the team committed millions to 3 top guys in 2010 and skimped elsewhere. Sammy Solis: LHP with Potomac: coming back from injury in 2013 he pitched in Potomac the whole season. He was a bit “old” for A-ball but its understandible considering where he’s been. He excelled in the AFL and is being mentioned as a possible Loogy with the big-league team, so I’d have to think he’s a lock to be protected ahead of the draft. Harrisburg middle relievers Matthew Grace, Aaron Barrett and Neil Holland: all three have good to excellent numbers in relief this year for AA Harrisburg. Barrett especially as the closer. Grace is left-handed and could feature as someone’s loogy. Tough calls here; you can make a case that the team would like to retain all three guys as bullpen reinforcements in the coming years. You can also make the riskier case that all three guys, while valuable and skilled players, may not stick on a MLB roster the entire year so perhaps they’re good bets to be left unprotected versus someone already on the 40-man roster. The rest of the remaining 2010 college-age draftees are all either currently on the DL or are in Hagerstown or below, making them very slim candidates to be protected or picked. Cameron Selik was one guy who could have made some noise, but he got hurt this year and isn’t going to get picked. 2009 High School-age drafted players newly eligible: just Michael Taylor, who has a ton of speed (51sbs) and an improved OBP (.340) while repeating high-A this year. I know there are readers here who like Taylor a ton, so this isn’t spoken out of disrespect. I think Taylor has potential. Maybe he “made the leap” in 2013. Maybe he’s going to light up AA next season and suddenly we’re talking about him being Denard Span‘s replacement and not Brian Goodwin. However, I can’t see someone rolling the dice with him in a rule-5 situation. He’s never played above A-Ball. In today’s modern game, with 12 man bullpens and thus shortened benches, I just can’t see someone like Tayler getting carried for an entire year. I think the team may very well roll the dice and leave him exposed in December, and revisit 40-man protection in 2014. Last year’s selections Erik Komatsu and Danny Rosenbaum: Komatsu has been hurt all year, Rosenbaum was decent but not over-powering in AAA. Neither guy seems worth protecting since they already were selected and failed to stick. But, they’re both AAA-level talents who could be someone’s bench player/swing man so they may get plucked again if not protected. Justin Bloxom and Sean Nicol are both college-aged 2009 draftees with run-of-the-mill numbers in AA; they’ll play out the string until they get pushed out at this rate. 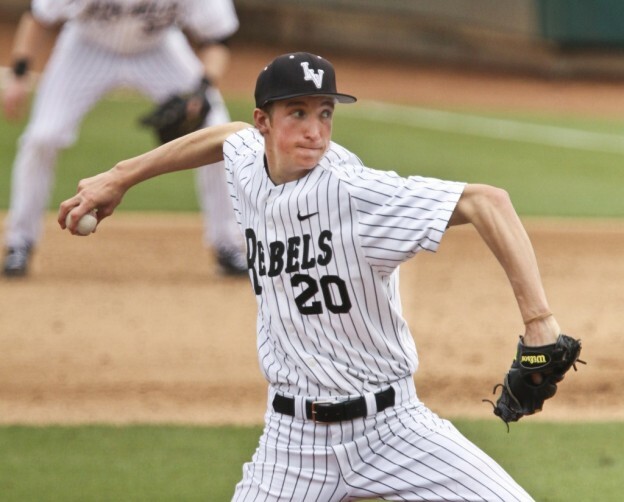 Patrick Lehman ended the season on the DL, making one think he’s not likely to get drafted. Well that and his numbers were not good. Matt Swynenberg has looked better in AA than he did in high-A; has he done enough to garner some interest from another team? Destin Hood: our 2nd round pick in 2008 just seems to be spinning his wheels; his batting average has dropped as he’s repeated a level. He’s officially in bust status. Adrian Nieto has earned a placement in the Arizona Fall League and was Rule-5 Eligible last year, but was not drafted. He’s yet to rise above high-A and seems a long shot to be taken (though, the Nats did pretty well plucking one Jesus Flores out of the Mets high-A team one year). So, who’s getting protected? As of the time of this writing, the Nats roster sits at 39 of 40 (again, assuming Souza is really there), so there’s just one empty spot. But there’s at least a few guys on the fringes of the 40-man who I think could be waived and have a high likelihood of being kept (namely, Tyler Robinson and Corey Brown) if the team thought it needed room for either protectees or free agents. The back-end of this roster is getting a bit clogged. Depending on how many spots the team keeps open, in order I’d protect Solis, Barrett, Tayler, Grace, and Holland. For me, only Solis is a lock. The rest (for reasons described above) may be calculated omissions.